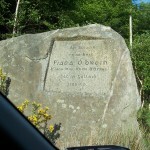 Fiach Mac Hugh O’Byrne, the Wicklow firebrand. 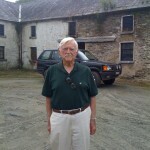 Lt.-Col. Charles Artaud Byrne at Farrinerin in July 2012, the place where Fiach Mac Hugh was executed with his own sword. Charles is the direct descendant of Fiach Mac Hugh O’Byrne. A scenic view of Glenmalure. Statue representation of Fiach Mac Hugh O’Byrne. Fiach Mac Hugh O’Byrne is probably the most documented Byrne in history. A celebrated rebel and warrior Chieftain, he is famous for his strategic excellence in battle which was extremely effective against the English during the reign of Elizabeth I most noteably at the battle of Glenmalure in 1580. 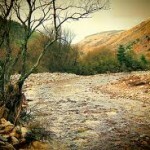 It would take a further 17 years after Glenmalure for the English to capture Fiach. He was executed by Captain Thomas Lee at Farrinerin in Ballinacor, Co. Wicklow on the 20th of July 1597, his head then severed with his own sword, an act which would ensure his legendry status as an heroic icon of Irish history. Fiach Mac Hugh O’Byrne is probably the most famous of all the Byrnes and celebrated as a great war strategist. Such were his successes that he became known as “The Wicklow Firebrand” and an almost mythical presence in Irish foklore. His most famous success in battle is undoubtedly the 1580 Battle of Glenmalure in which he defeated Queen Elizabeth’s envoy the new Lord Deputy of Ireland, Arthur Grey, 14th Baron Grey de Wilton who had arrived in Ireland with 6,000 troops with the soul aim of capturing and executing the illusive O’Byrne. It would take a further 17 years after the battle of Glenmalure, in which the English suffered mighty losses, before the hand of an English officer would be laid on the person of Fiach Mac Hugh. This page is currently under construction and more information will follow soon.